Quality & Durability = the Greatest Bargain. HAPPY’s quality construction delivers longer service life, greater production and very low maintenance cost. Out-of-this-World User-Friendliness: Ease of use from untuitive touchscreen controls, auto error correction, and simple maintenance means less downtime and more production time. Industry-Leading Support from TEXMAC Direct: In supporting a reliable, durable line of machines, our techs staff can spend more time with customers and help them get more out of their machines. MACHINES TO SUIT ANY SIZE OPERATION: Click on the links below to explore our various models. Amazing, Right out of the Box. HAPPY machines are so thoroughly and carefully assembled at the factory in northern Japan that, after arriving at our warehouse from the factory, they’re shipped straight to customers without needing to be checked or repaired by our staff beforehand – something not possible with some other brands! Unparalleled Education Program. 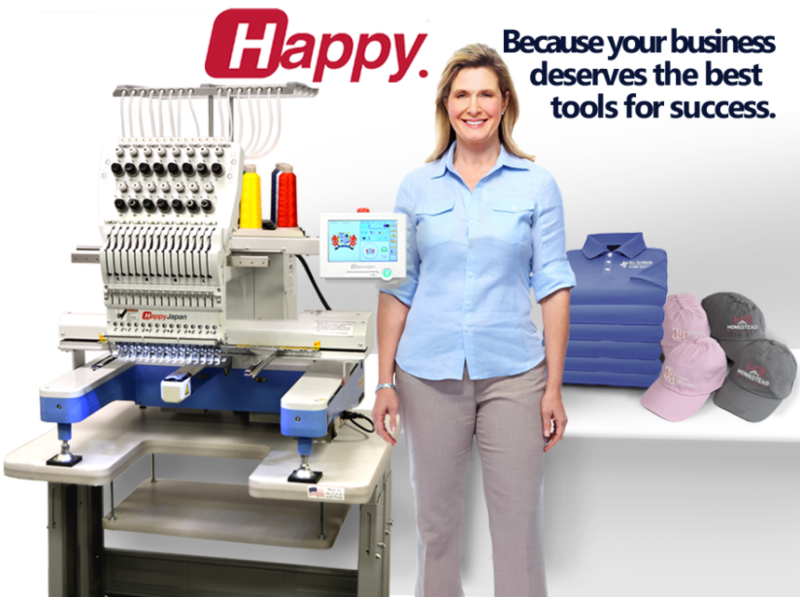 Because the journey to success is ongoing, our customers have virtually unlimited access to our classroom and online training sessions, for embroiderers of all skill levels. We Actually Work to Save Our Customers Money. Your ownership experience is important to us, which is why we readily share preventive maintenance and “tech tips” that work to eliminate or minimize the need for service visits. That means less down-time, and more production potential for you and your shop! Enthusiastic (Helpful!) Owners’ Community at Your Disposal. We must be doing something right with our philosophy in making our customers “HAPPY”, because there’s a huge online community of active HAPPY machine owners – all eager to share their experience and advice with each other. New Happy owners are able to take advantage of this invaluable resource. Deeply Experienced Staff. Our technical, education and sales staff have many years’ experience in the industry, most with more than a decade of experience each working with HAPPY machines – an assurance that you can quickly get sound, practical advice both before and long after you make your purchase with us. Rich Online Library of Learning Material. Our training and technical staff are constantly creating illustrated documents, animations, and video to help owners improve their knowledge and skill. We’re With You for the Long Haul. With the above, this almost goes without saying. We are proud to count many customers who have been with us for decades as their machines have endured, and hope that you’ll have that same “HAPPY” experience for as long as you own your machine!